I have to admit, I'm not a huge coconut cream pie fan. I like them, but will usually opt for lemon meringue or banana cream. 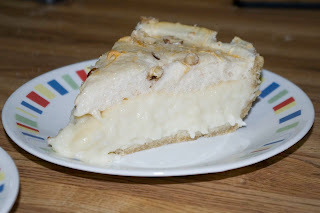 But I had a couple of friends who asked for a coconut cream pie recipe that is healthier than average. (also... my meringue fell a bit while cooling due to extremely damp weather today). Combine Splenda, potato flour, vanilla powder, and nutmeg in a 2 qt. sauce pan. Gradually add milk, whisking until well combined. Cook over med-high heat until thick and bubbling, stirring frequently. Remove from heat. Beat egg whites and egg slightly. Add 1 cup of hot mixture slowly into eggs, whisking quickly to prevent eggs cooking. Add egg mix into saucepan, again whisking well. Cook over med-high heat, bringing to a boil, stirring constantly. Continue to cook at a boil for 2-3 minutes. Remove from heat. Add olive oil and vanilla extract. Mix well. Add yogurt, whisking constantly until combined. Pour immediately into pre-baked pie shell. Recipe here. Cover with Meringue (recipe here). 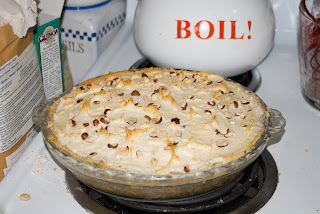 Optional - Sprinkle additional coconut and hazelnuts onto top of meringue. Bake at 350 for 15 minutes. Cool on a wire rack. Chill before serving.